Here is Simplicity 4020, once more. Looking at this, I realize the bustline is perhaps a bit too high. I’ll have to remedy that next time I make one of these. The fabric comes from Amsterdam and has been absolute heaven to sew and wear. You may not see it on the pictures, but the background is a pale blue-grey. Gorgeous. I’ll be certain to stock up on similar fabrics next time I’m up there. Especially as my favourite fabric store in Paris, Bouchara, is now no more. Sigh. For a more relaxed look, I made a matching hair scarf with the fabric remnants. Burda Blouse – "L’Été enfui"
Allo Isabelle!J’espère que tout ira mieux maintenant. Je ne savais pas pour le train (vivant au Québec), mais ton histoire m’a ébranlé. J’espère que tu es correct. Ton petit haut est tellement joli!! J’avais aimé la version asiatique, mais celle-ci est encore mieux!!! Quant à savoir si le buste est trop serré, à moins que le haut soit inconfortable, moi je trouve qu’il te va très bien. J’ai bien hâte de voir ta blouse Burda! Et en passant, FÉLICITATIONS pour la thèse!!!! J’ai pensé très fort à toi ces derniers mois même si je n’écrivais pas! It’s good to see you again! While I don’t have any suggestions for a name for this lovely blouse, I do know that you look beautiful in it and the colors suit you very well. Get some rest and pop back in when you have computer access! Un nom japonaise, je pense. Jolie blouse. What a lovely blouse, as always! How scary to have the tunnel fire just after your train passed through; so glad you are alright! Lovely to “see” you and in such a nice blouse too. The bust position looks perfect to me, but maybe it feels uncomfortable? Take your time to rest and get back to full strength. You certainly look lovely in that blouse. The colors look great on you. It’s a beautiful top and looks great on you! The fabric is lovely and the colors really compliment your complexion – a big win! I’m so happy everything went well at the conference and that you are back amongst us! Love this top and can’t wait to see the Burda one! What an absolutely beautiful top, even if it has no name! The fabric is perfect for it and it really suits you. Coucou Isabelle, Je suis ton blog de loin en loin mais je ne t’oublie pas ! Bon courage pour tout ce que tu as entrepris ! Ta blouse est réellement très jolie .J’aime beaucoup le tissu et les coloris qui te vont vraiment bien : bravo ! Bises ! You may feel exhausted, Isabelle, but you look wonderful! So nice to see you again and in yet another lovely blouse!! The top is lovely, Isabelle. I can’t wait to catch up once you get a computer! I’ve missed you! 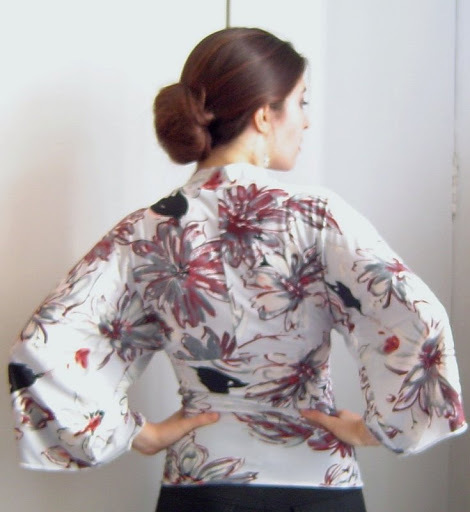 Que bella camisa japonesa! And I hope you get a new computer soon. Lovely blouse, where did you get the fabric in Amsterdam? You must know the Amsterdam fabric stores better than I do now! Glad to hear you will be posting more regularly. Yep, that’s one pattern I have in my stash too and you confirmed it again – I have to do this. It’s simply, but gorgeous. Thanks for reminding me. You look great! It was like the fabric was for this pattern! I’m going to have to dig mine out and make this again…. 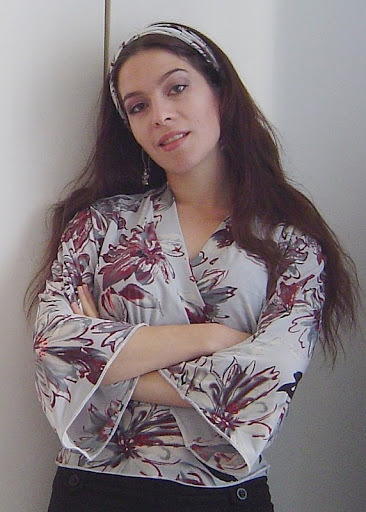 Hi Isabelle,Very beautiful this blouse! 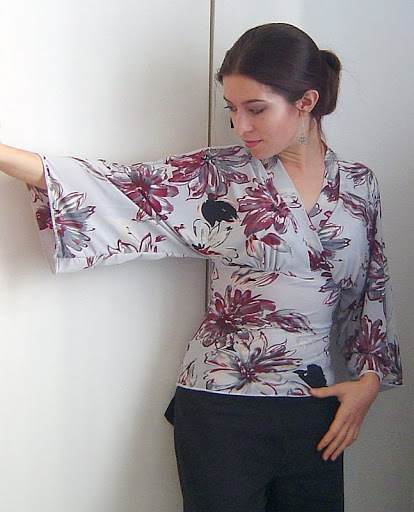 I love the Oriental Style!The fabric is perfect to this model.Congratulations! Ma chère Isa !Je suis ravie d’apprendre que tout s’est bien passé à Londres (malgré les problèmes de train …), et surtout que tu vas pouvoir souffler un peu !Ce haut est magnifique, je crois que je l’aime encore plus que le premier !Je t’embrasse bien fort ! Long time no see (OK, surtout a cause de moi, j’avoue ! )Ta tunique japonisante est tout simplement magnifique. Et “Waiting for Blossoms” me vient a l’esprit, en ce debut d’automne… Les Japonais sont tres forts en expression poetique, je devrais prendre des cours !Bravo pour ta these, btw. Soulagee ? Hello Isabelle.The top looks fabulous and it looks great on you!Keep up the good work. C’est superbe, j’adore la forme, j’adore le motif!!! Ouah! j’aadooore!